How can I add sponsored posts to my social wall? 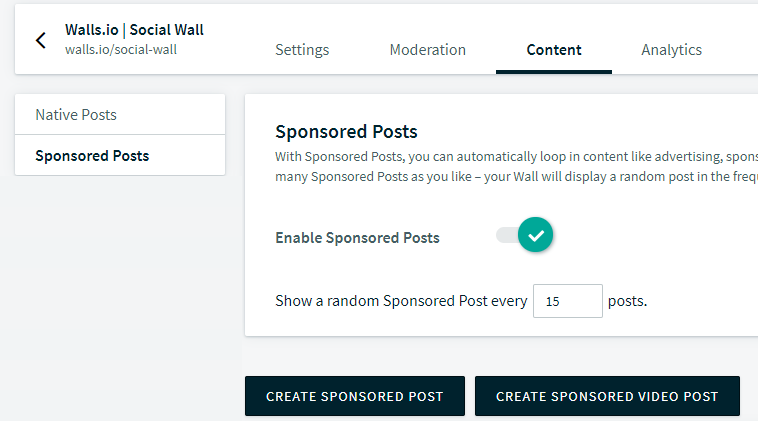 To add a sponsored post (also referred to as "sponsored tile") to your social wall, go to Content > Sponsored Posts in your Walls.io account and "Enable Sponsored Posts". You have the option to create an image and text sponsored post or a video post. Upload as many different pictures or videos as you want and set up intervals to define how often those sponsored posts will show up on your wall, e.g. “every n-th post is a sponsored tile.” So, if you set the interval to 15 posts, every 15th post on your social wall will be a sponsored one. Please note that Sponsored tiles cannot be enabled for the Map theme, but they work with all other Walls.io themes. Sponsored posts are only available in the Walls.io Premium plan. To create a sponsored post, click on "Create Sponsored Post" in the Content > Sponsored Posts view. You will need to add some content (text or image or both). You can find further info about the image size and text length in this article. When you're done setting up your social wall, just click on "Save". All the saved posts are listed under Content > Sponsored Posts. You can always edit or delete a Sponsored Post. To create a sponsored video post, click on "Create Sponsored Video Post" in the Content > Sponsored Posts view. 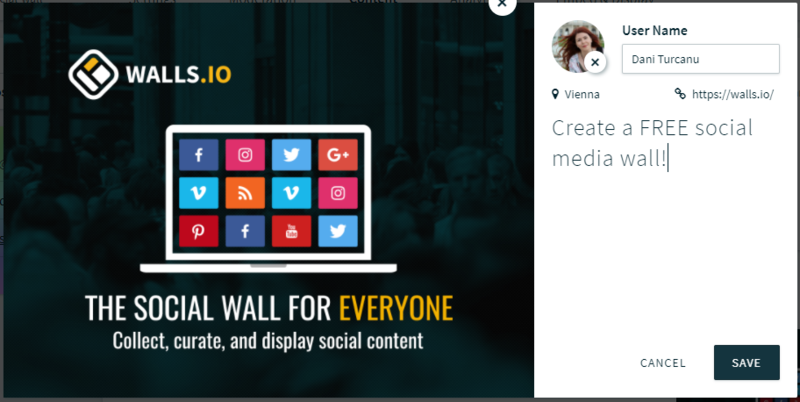 Just drag and drop your video to upload it to Walls.io. The only accepted format is MP4. For your upload to be successful, the file size should not be higher than 20MB. You can also add more text, a link and your location if you want to. Just in case you need some inspiration on how to use our sponsored posts feature, check this out!